Your small business can help employees save (tax-free) for medical expenses and insurance costs by setting up a Qualified Small Employer Reimbursement Arrangement (QSEHRA). This arrangement is part of the 2016 law called the 21st Century Cures Act. In the past, large companies have been able to set up Health Reimbursement Arrangements (HRA's) for their employees, and this new law allows smaller companies to help employees set up similar accounts. 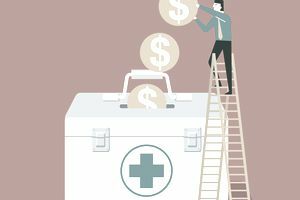 But small businesses that can't afford to provide health plan coverage to employees now can set up a QSEHRA to help employees pay for their own health plan costs by giving them an annual benefit for insurance premiums, medical expenses, or both. Employers don't have to pay payroll taxes (the employer portion of FICA taxes) on benefits paid to employees under this arrangement. In addition, the company can deduct the costs of the benefit payments and also the administrative fees of the HRA as a business deduction. For small businesses trying to keep control over their benefits budget, the QSEHRA allows them to put a cap on potential costs by setting a benefits allowance for their employees. An HRA is a Health Reimbursement Arrangement. Notice it's not called an "account." It's not a savings account that employees can put money into and it's not health insurance. The employer doesn't make contributions to the account; the employees do this themselves. HRA's can only be used for qualified medical expenses, such as those already covered by a medical plan, or for health care premiums. The difference between a QSEHRA and a traditional HRA is that with the QSEHRA the small business setting up the plan does not provide health insurance for employees, but the employer makes the contributions. Is My Small Business Eligible to Set up a QSEHRA? If your business is not an applicable large employer (ALE) under the terms of the Affordable Care Act, which means you have fewer than 50 full-time equivalent employees (based on a formula for calculating the equivalent of part-time workers). What Are the Requirements for a QSEHRA? You (the employer) fund the arrangement; employees don't contribute through their paychecks. All eligible employees have the same terms and benefits from this arrangement. The employee must show you proof of health care coverage and the QSEHRA pays or reimburses medical expenses of the employee or family members. You can reimburse employees for the monthly premiums of their plan or for their medical expenses, or both. Medical and insurance reimbursement expenses must be documented, within the limits of the annual maximum, and "qualified" as defined by the Affordable Care Act. There is an annual maximum reimbursement in qualified expenses for employee coverage and qualified expenses for family members. The maximum dollar amounts are adjusted each year. The adjusted limits for 2018 are $5,050 for self-only coverage and $10,250 for family coverage. You don't have to give employees the maximum, but you must stay within the maximum to make the plan qualified. In addition to providing HRA benefits to employees, small business owners may be able to use a QSEHRA to give themselves a tax-deductible benefit (to the business). The eligibility of the owner to participate in a QSEHRA depends on the type of business. Corporations. An owner who works as an employee within the corporation (not a shareholder or board member) may be eligible to participate in this arrangement. S corporations. An S corp owner who owns more than 20 percent of the corporation is considered self-employed and not an employee. This owner is not eligible for the QSEHRA. LLCs, Partnerships, and Sole Proprietorships. The owners of these business types are considered self-employed and are not eligible to participate in a QSEHRA. Employers are required to give employees written notice about this arrangement at least 90 days before the beginning of a year in which the arrangement is provided. Employees who are not eligible at the beginning of the year must receive notice when they become eligible. The best way to set up a QSEHRA to make sure it meets all the requirements is to hire a third-party administrator (TPA) to handle the individual employee accounts, determine the eligibility of employees, and make payments to employees for qualified expenses. An internet search can give you some suggestions, or check with your bank to see if they have this service. The amount of the QSERA benefit for the year is not part of the employee's income for FICA taxes (Social Security and Medicare) and income tax purposes. But, as Thomson Reuters explains, the employer must report the amount of the benefit on the employee's W-2 form (Box 12, Code FF). The employer must report the amount the employee is eligible to receive from the QSEHRA (the "permitted benefit"), not the amounts actually received. IRS Notice 2017-67 has more details on the QSEHRA.